We're back for the episode that literally debuted on my birthday! It's Part 4 of the Tri saga, and finally we're starting to get some real answers. While not perfect, Part 4 gave us plenty to discuss, praise, criticise and shudder in utter disgust because OH MY GOD, HE LICKED HER FACE! 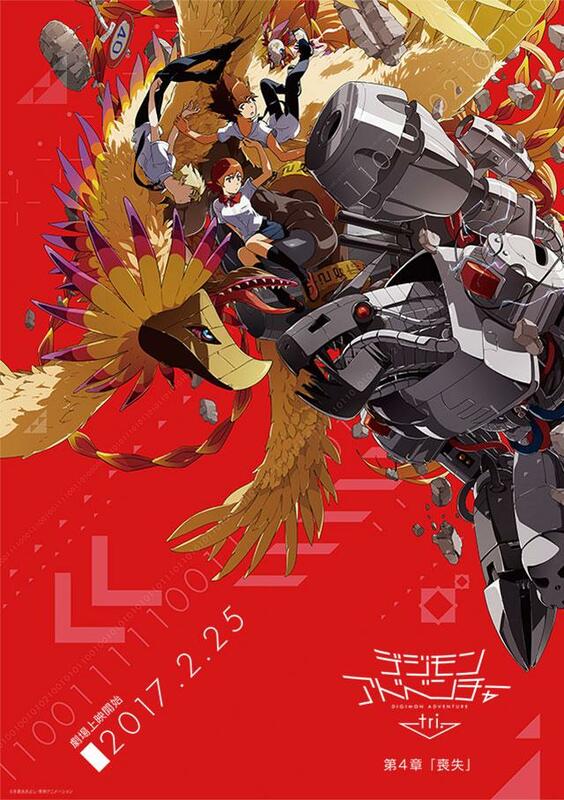 Between this, Next Order, Cyber Sleuth, the original series... Digimon definitely love their metal dinosaur of death. 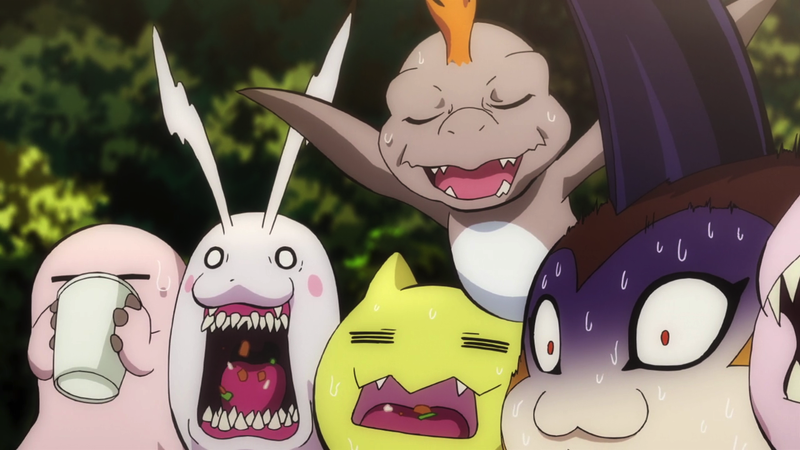 After the surprisingly tragic ending of Part 3, in which a "reboot" occurred and the Digital World was reset, thereby eliminating the infection spread by Meicoomon and restarting the memories of our favourite Digimon companions, I was worried on which path the series would take. Would Part 4 restore their memories via convenient backup, or keep this decision and force some harsh realities upon our heroes? Thankfully, "Loss" makes sure to stay true to its guns and not commit any acts of regret with their decision. I just wish they could have spent more time developing the memory removal. As you'd expect, the heroes immediately try to bond with their partners again and succeed surprisingly quickly, with the exception of Sora and Biyomon. None of them really seem that upset about Agumon forgetting when he defeated Shellmon, or when Angemon wiped out Devimon like a badass. They just accept it and move on, and I really wish the series could have taken a time to at least ponder this loss. The many stages of watching Tri. Biyomon on the other hand is refusing to bond with Sora, and it feels far too manufactured for the plot. Her relationship with Sora is surprisingly hostile with little provocation, as if Sora alone did something cruel to Biyomon and she's deserving of hatred. While Biyomon is justified of suspicion, she is far more aggressive than I've ever seen her and it really doesn't fit with her character. 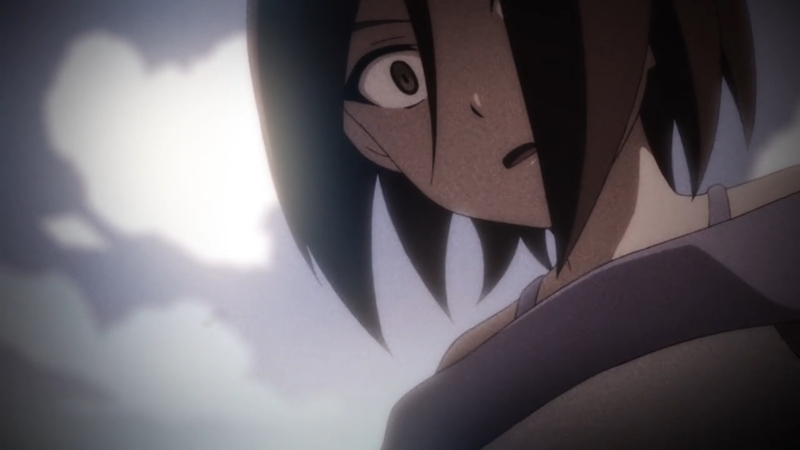 That being said, you do get an emotional reaction for poor Sora as you watch her face this dilemma. I genuinely felt bad for her, far more than I did for Mimi during her emotional episode in Part 2. As frequent readers will know, I'm not a fan of the two new adult characters that have joined the series, but they're certainly getting my interest as we find out more about their motivations and how they are impacting the teens. In fact, long-time fans of the series are really going to get rewarded this time as plot threads from our childhoods are finally getting resolved again. I'm doing my best not to spoil it too much, but I suggest you go back and watch the original two Digimon series. It will really help you understand exactly what is going on and the payoff we're finally getting. Speaking of new characters, Meiko and her Digimon are far less annoying this time around, although it is questionable how Meiko even arrives in the series. As in, she is literally just dropped in the story. I am not even kidding. Speaking of the past, lets talk about one of the most badass creations ever devised in fictional history; The metal dinosaur Machinedramon! Right on the poster of Part 4, there he is in all his metal, fantastic glory. And by god, he presents a fantastic, if not overly long, finale against the Digidestined. Destruction and chaos, and literally the T-Rex roar from Jurassic Park. You owe it to your inner child to watch Machinedramon roar like the T-Rex. 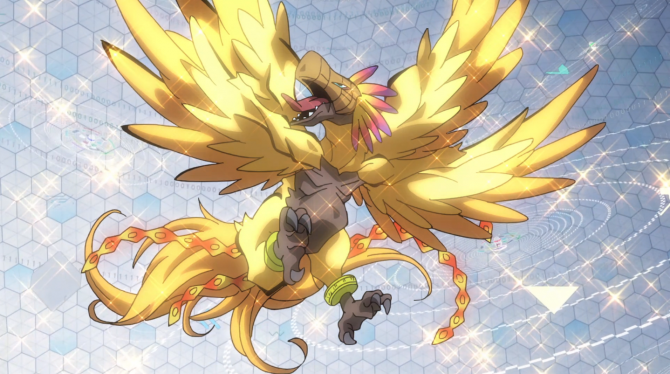 He's a true force of nature and the battle between him and Phoenixmon/Hououmon is a beautiful set-piece with animation that truly manages to keep up with it. So does Biyomon like... swap genders when she digivolves? 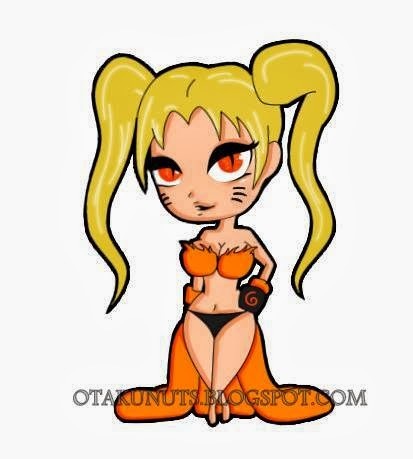 Because we see abs but no breasts. And Meicoomon grows breasts so... What is biology?! It's just too bad that Machinedramon has completely lost his personality. In fact, that has been a running flaw for the past 4 movies of Tri. Every final "boss battle" has been against an emotionless monster that just roars and attacks the protagonist. While I didn't care originally because it was just some robot knight called Alphamon, this is Machinedramon! This is a robot dinosaur from my childhood! Why would you remove his personality?! Which robot dinosaur of doom would win in a fight, do we think? Like I said earlier, we do finally seem to be getting some answers to questions started in both the original Adventure anime and Tri, which is indeed a blessing. To avoid spoiling it for you, I won't go into detail about which questions were answered but I can say that one of them is potentially problematic. (If you wish to discuss spoilers, please leave a comment below!). After discussing it with fellow nerd Claydragon, I've found out the answer that to who could be behind this and why sounds fairly disappointing. It's a plot point that many Digimon stories, including the severely underrated Cyber Sleuth, utilise and both myself and my companion who travels in my blue box with me are concerned over what could be a lack of creativity on the part of the readers. I'm really trying to avoid spoiling it so I'll only give one small hint; Yggdrasil and Homeostasis. Unlike Part 1, Loss' opening scene is extremely intriguing and really makes me excited for the next instalments. Lastly, one major annoyance for me was the outcome of this reboot. It's hinted very early on that this reboot has caused the dead to return, the old to become young and many more things to return to what they were once were. As someone who grew up with the series almost obsessively, I really would love to see this explored more. Can you imagine if Devimon or Etemon came back? Wizardmon and Leomon and maybe even Myotismon?! This is the drawback of not having a full series and instead sticking to several movies, and what should feel like a reunion of fanservice and greatness is instead replaced with a surprisingly barren Digital World. It feels far too empty for what is meant to be a world of literal digital monsters. Character of the Movie: Sora for her emotional moments that felt truly genuine. Best Part: Machinedramon is big in every way. Worst Part: Revivals are only hinted at, not shown. This makes me soooo uncomfortable on sooo many levels.